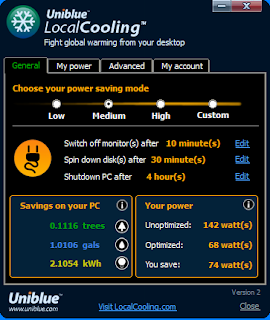 LocalCooling is a free program from Uniblue I have been using for over a year and with the recent update to Version 2 it is now something I'm comfortable recommending (Uniblue got rid of the annoying beep LocalCooling made before blanking the screen). 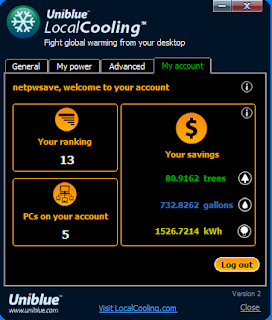 What the LocalCooling program provides is an easy way to adjust the energy saving options on your Windows XP or Vista PC. In addition it tracks your savings and tells you how many trees or gallons of oil or kilowatt hours you have saved. 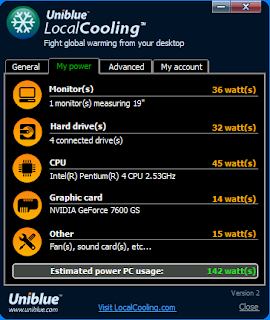 Then if you have multiple PC's and want to setup a free account LocalCooling will track the savings on all of your PC's. If you will notice the savings do add up over time. So give it a try and save a few dollars and help the environment in the process. Hilary your welcome. I was going to email you with some feedback and suggestions on how to promote LocalCooling.